Small selection of wines but offered to let me try several before buying a glass. Ordered salad and beef bourguignon - both very good. Nice team in control - especially Louise who gave a very warm and genuine welcome. Visited lunchtime after receiving a flyer through the door. It said exccellent range of beers and local real ale. (Yes still only one real ale on pump, rest bottled). Beer a bit more expensive than average. They describe themselves as the Queens Head Pub, but it feels more like a restaurant. When you go inside initially if feels big then you realise the very large mirrors behind the bar are giving that illusion and when you look across you see yourself looking back! It is acutaly quite small. There was some seating outside though. It is a lovely building but is lacking in something and I think there is no area where you can just hang out for a casual drink, because the emphasis is on food. The food is very well presented but not sure about their claims. The menu said the pork belly in cider is cooked for 9 hours, but I do not believe this as it wasn't as tender as you would expect and it was fatty. We believe the sauce is made with cider. Was not impressed by the accompanying red cabbage. The menu is available online queensheadpub.co.uk Having read the previouse reviews I have to say there is no Thai theme now more italian. This has been one of our favourite summer Sunday lunchtime venues for a few years and, having learned from this site that it was under new management, we went along to see what changes had been made and what impact they had had. This has always been a traditional country pub and they have maintained that feel, though it has been 'smartened up' a bit. It seems that they have reduced the number of tables to make the place more spacious, and the pub has a more airy feel as a result. Didn't like the new carpet which looks as if it has been laid upside-down, but it does give the place a clean aspect. The menu is a lot smaller than before, and the chalkboards have gone which were full of options, but the range of dishes is still adequate. It wasn't too busy when we arrived, having reserved a table at 2, and the welcome and service was a tad slow. The food however was very good. We had Beef Bourgignon and the Sea Bass, which were both excellent. I think the new management are feeling their way a bit, so we might need to be patient before they get up a head of steam. But the pub is still well worth a visit. We live in fleet and heard the pub had been totally refurbished with a new modern menu and fast becoming the talk of the town.. Well, they were not wrong and i now know why ! In my opinion it is now the smartest pub in town but in a cosy and relaxing way. The decor and comfortable furniture create a real homely, village pub. It was busy with locals enjoying a chat/drink with eachother and we had to wait 15 min for a table in the restaurant and it was MIDWEEK ! We'll book next time. The food was exceptoinal. The service was so friendly and attentitive it surprised us as we were only in a pub and the waiter a mature and professional version of Manuel/Faulty towers. A great evening was had by all and would recommend it whole heartedly. 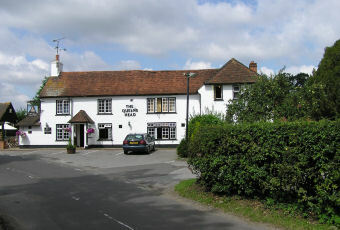 This pub/restaurant has undergone some major changes in the last 6 to 8 weeks and I can only say many positive things about the place, the food is excellent and the staff are very warming and friendly and made my visit a pleasant one, so much so that I've since been back on numerous occasions and everytime it's been as enjoyable as my first visit. Onwards and Upwards and good luck to all associated with the place! !